Griff, there was not an agenda for last night’s meeting nor was the Council given direction on the format, topics, etc. My impression was that the session was primarily to give citizens more information about what happened during the “event” rather than provide a forum for Council discussion. That being said, I agree that the discussion which you hoped would occur last night still needs to take place. I’d add (and suspect you’d agree) that emergency communications are just one piece of the puzzle and the city has much more it can and should do. I encourage LoGroNo readers to go beyond commenting in this forum and to send feedback, questions, suggestions, etc. directly to the Mayor. My mistake – there was an agenda with the Friday memo & worksession packet (I was out of town and didn’t read it until now), but it confirms my comment that the intention was more about presenting information to the public than discussion by Council. Griff: I will admit that last night’s meeting felt ‘off key’ … But basically it was announced at previous council meetings as a report, and that is what it was. However, one thing stuck out plainly: because of the City’s new reorganizational structure, the City’s Public Safety Director, Police Chief Mark Taylor, was given the task of reporting on the coordinated efforts, and yet , through no fault of his own he was not there; he was on vacation out West. I felt having Chief Taylor report was an unfortunate choice to make, since it relegated Deputy Chief Walerious to the uncomfortable position of explaining choices made about the rising river levels … choices that were unclear because of the edited version of the timeline of events. ( 9 pages cut to 4-5). I think Deputy Chief Walerious,the person who was in charge of coordinating the effort along with the emergency management director, Tim Isom, should have presented the facts and timeline. I don’t know who made the choice to structure the presentation in that manner, but it was an unfortunate choice, IMO. City staff is working on a plan for how to deal with possible spring flooding in the area. Northfield Public Safety Director Mark Taylor says city staff is getting a head start in part to acquire possibly necessary supplies, such as sandbags. As for the likelihood of spring flooding in Northfield, according to the preliminary information, Taylor says that under normal thawing conditions, the area is not in danger of major flooding. But, he cautions, there are variables, such as a quick spring thaw that could affect the river level significantly. Taylor says the city’s plan will probably include information for residents who should consider flood insurance—which requires a 30-day waiting period before it goes into effect. Also, city officials will include a list of resources and relevant contact information for people who need assistance should a flood occur. Taylor says once finalized, the information will likely be sent out to residents and also available on the city’s web site. Now that’s a mouthful, David! What the hell are “preexisting sensemaking stuctures”? The decision-making process is of obvious interest to military folks. In fact, in the 1970’s Air Force a pilot named Boyd created the idea of the decision-cycle, or OODA loop, with regards to aerial dogfighting. The idea is that the victor actually “gets inside” the opponent’s decision-cycle, adding confusion and chaos at such a rate that the other person is unable to process the changes fast enough. The opponent loses the initiative (goes for proactive to reactive) and often the battle. Obviously you can see how in an emergency situation you’d want your civilian emergency personnel to have a framework in place that adequately accounts for the uncertainties of a situation, because dealing with emergencies in a reactive way is never as effective as doing so in a proactive manner. The plans they develop would be, in part, their “preexisting sensemaking structure”. Hopefully David Koenig would correct any of the bits I got wrong. Well, I pulled that sentence from the abstract because I thought it was convoluted in anything but an academic setting. I chuckled when I first read it and thought it probably takes about two or three minutes to understand what they mean! My understanding of “sensemaking” is that it is just how you perceive and process what you see, or the information with which you are being presented. In other words, how you make sense of things. Pre-existing sensemaking strucutres are then the filters through which you see things and reach conclusion. When your past experiences don’t include a particular outcome, you may assign too low of a probability of that outcome being possible when you try to make sense of what you know. Or, other things in the present may affect your ability to make good sense of the future. I won’t name any names, but I will give two examples from my local experience, both of which occurred the day before the flooding started downtown. I had personal experience with the floods of Des Moines in 1993. My experience was that heavy rainfall can lead to floods that were well in excess of what had ever been experienced before or even expected by experts. So, my sensemaking was influenced by this experience and I thought there was a high likelihood that sandbagging might be needed downtown. So, I contacted both a city leader and the leader of a local group to offer to try to organize a list of people who could be called out quickly in case sandbaggers were needed. Call it a volunteer first-responder list, if you will. I had assembled one of these when I was on the City Council and I thought we my try to update it now. The City employee said he thought they had the situation under control as the forecast was for a crest of the Cannon to be below flood levels. But, he said he would pass my name along in case anyone wanted to call. I never got a call. But, I also believe the person to whom I spoke was acting in good faith and had no real reason to expect forecasts could be so wildly wrong. It wasn’t withing his sensemaking experience. The other person deferred my request to “another week” citing a busy meeting agenda on the day of my request. That person was also acting in good faith on what was immediately of concern to him. Perhaps he had no appreciation of the potential impact of flooding or a sense for how likely it was that volunteer sandbaggers might be needed because he had no experience with such. Again, he was most focused on the issue in front of him (a full agenda for a meeting) and may rationally, according to his experience, have discounted the value of having pre-planned for the possibility of the water-level forecasts being wrong. Both of the people mentioned above ultimately contributed importantly to the sandbagging and volunteer-recruitment effort. So, in the end, everyone came around the same place. And, my guess is that their sensemaking process will be different this spring. Whether it is natural disaster planning or business planning, we should always ask “what if things aren’t what we expect” and examine our ability and processes to respond. This is especially true when the result of being wrong is a chaotic situation. For example, what is the plan for notification and evacuation of our schools, the colleges, the neighborhoods if a toxic chemical spilled from a train passing through town? Do any of us know? Would there be less chaos if we all knew the plan and how to respond? Or, that a plan even exists? The answer is yes, and the outcome would likely be better than without any of us knowing. On Monday, the city’s public safety director will ask the council to approve a policy outlining city priorities should Northfield again experience flooding. Last September, the Cannon River overflowed its banks, sending flood waters into several city parks and up to the Safety Center. 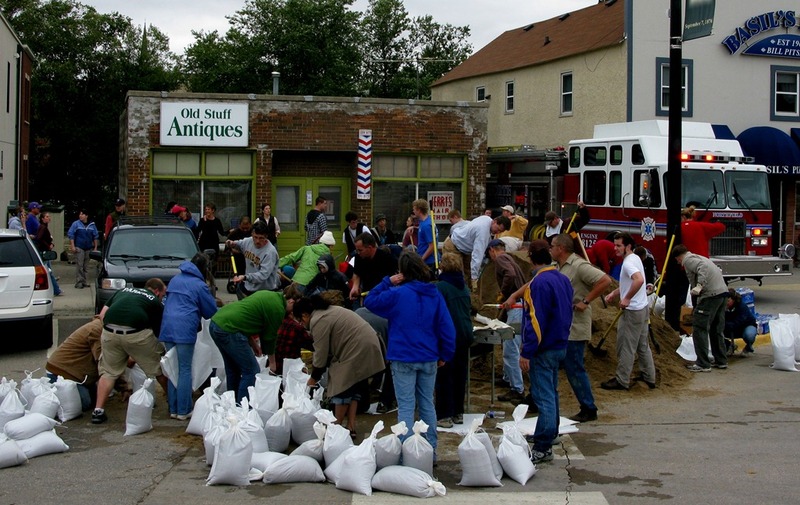 Some downtown businesses and Carleton College properties also flooded. … Unlike last September, emergency officials won’t make aiding private property owners with flood preparation a top priority. “We don’t have the staff to do it,” said Public Safety Director Mark Taylor. I think the city is going to have to make sure their priorities are clearly understood. Priority 1 is “Emergency response to situations that need immediate attention”. Priority 6 is “Business and residential property assistance (non emergency)”. The city will need to ensure that business and residential owners realize that any situation where no “lives are in danger or the threat of serious injury exists” is considered a non-emergency, even if your house or place of business is floating down the river. Just because you consider a situation a priority 1 emergency, it doesn’t mean the city will. Someone needs to learn how to communicate, and write the information to be presented in a cohesive manner: see priorities 1 and 6, above. We do not… for the most part… have housing along the river; we do have businesses that are vital to the economy of the city. They have to be able to pay their taxes, if you just want to be economically crass about it. To say nothing of the safety of the business owners who were at their buildings, their personal safety, and the protection of the business, is an unbelievable lapse in judgement. The businesses along the river are THE public safety priority, IMO. What would be a larger priority for our public safety staff , during such an event, than the initial protection of the people, properties, and businesses that line the channeled river in the downtown, until they can call in the National Guard? I know Chief Taylor was not here, but there was little to none assistance given to private property owners in the September flood. 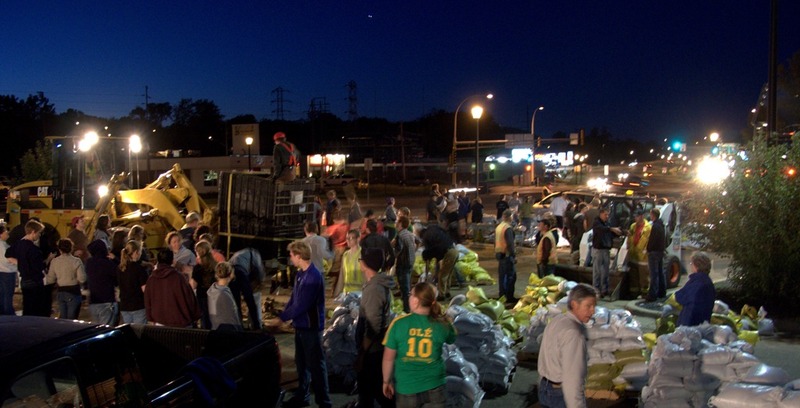 The city barred them from their properties and gave a little assistance on “sandbagging after the fact.” If the city had true leaders they would have assisted the property owners–and they would have been reimbursed for their efforts due to the disaster declaration (federal and state). Instead the private property owners are still reeling from the damage—and will never be reimbursed. What the city did in September was mediocre–if their plan is to do less, good luck. preparing for the potential for flooding and will monitor the levels of the Cannon River throughout the spring. Due to a lack of a reliable USGS gauging station near Northfield, staff will be installing inexpensive, yet very effective monitoring gauges. These gauges will allow emergency staff to monitor river levels on a regular basis and trigger emergency protocol should a major flooding event appear to be eminent. A website has been prepared to provide information to the public regarding a variety of flood related topics. Topics include the City’s Emergency Priorities, Weather and Flood monitoring, Flood Insurance, Community Resources, Community and Volunteer Help, Emergency CodeRed Notifications, Flood Safety Tips, and Flood Clean-up Resources. We encourage people to visit the site if they have flood related questions. The Flood webpage can be found under the News and Announcements on the City’s homepage or on the City’s Engineering Stormwater Page. A meeting will be held for community members that have a higher risk potential for flooding. A packet of informational resources will be provided at this meeting and will also be available on the website. The community meeting is scheduled for February 28, 2011 at 6:30PM in the City Hall Council Chambers. They should also be using Twitter. See the top emergency preparedness Twitter accounts. As the Northfield City Council considers what to do with more than a million dollars in TIF money that must be allotted by the end of 2013, one proposal that recently surfaced concerning flood preparation should be considered. At last Tuesday’s Council meeting, two downtown business owners said that city leaders need to fully understand the impact of flooding on their businesses and put plans in place to minimize damage from future floods. The city’s Comprehensive Plan acknowledges the value of downtown to Northfield. Officials should consider investing in solutions that prevent significant flood damage to downtown businesses, especially those on the Cannon River’s west bank that are more susceptible. Northfield Public Safety Director Mark Taylor said the city has invested in monitoring devices to track water levels in Northfield and south of town on the Cannon River. While not necessarily high tech, Taylor says the devices should help predict potential flooding. As it was last fall when Northfield experienced what is now dubbed the “100-year-flood,” the city’s priorities are protecting city assets, namely the Northfield Safety Center, the wastewater treatment center and infrastructure, and then can turn its attention to businesses and residents. To help Northfielders prepare for a potential flood, the city hosts a public meeting 6:30 p.m. Monday at Northfield City Hall where residents can pick up information about potential flooding. A flood preparedness page has also been created on the city’s website, which can be found by clicking here. There, residents can find information on flood monitoring and prediction, flood insurance, community resources, flood-related safety tips and what needs to be done following a flood. The city has also partnered with 5th Bridge and Northfield.org to coordinate volunteering efforts and for residents to request help during a flood. Adam Gurno from Northfield.org says the page should be live on Saturday. Ironically, there’s no announcement on the City’s new Flood Preparedness site about tonight’s Flood Preparedness meeting at City Hall, 6:30 pm. Sigh. And people thought I was harsh!